Agilent Technologies has expanded its flexible PNA-X network analysers with 13.5, 43.5 and 50 GHz models. The 43.5 and 50 GHz models support higher frequency applications such as radar and satellite communications, while the 13.5 GHz model is ideal for lower-frequency devices used in wireless communications. 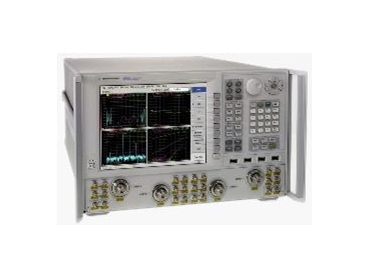 Agilent's award winning PNA-X nonlinear vector network analyser (NVNA) has also been expanded to include a 13.5 GHz model and the industry's first 43.5 and 50 GHz NVNA. These new solutions provide engineers developing and manufacturing active devices the flexibility to select just the right frequency that is required for their specific application. Aerospace and defense engineers working up to 50 GHz can now benefit from Agilent's single-connection, multiple measurements PNA-X. This analyser's integrated measurements, versatile hardware, and re-configurable measurement paths address this market's key challenges: test system costs, test complexity, throughput gains, accuracy and equipment space. Typical radar, satellite and electronic-warfare applications require complex test systems with multiple racks of instruments and numerous connections to the device under test. The PNA-X integrates the capabilities of a full rack of equipment into a single instrument, simplifying test stations, reducing equipment count by 50 percent, and increasing throughput by 400 percent. The PNA-X also offers a unique single contact solution for on wafer tests. This approach significantly improves quality by eliminating multiple probe contacts and enabling accurate characterization and reliable wire-bonding. Additionally, engineers working above 50 GHz can use the PNA-X to configure a banded mm-wave system up to 0.5 THz. The 13.5-GHz PNA-X model supports lower frequency devices used in the wireless communications market where reduced test time, number of test stations and test cost is critical. With low-noise amplifier tests there are typically multiple test stations, such as small signal gain/match, distortions, and noise figure; the PNA-X integrates these test stations into one. By integrating measurements from multiple test stations into one, the PNA-X reduces the number of test stations by as much as 75 percent and reduces costs by 30 percent. The industry's first 43.5 and 50 GHz NVNAs and new 13.5 GHz model now bring the NVNA solution to engineers working in the RF and microwave frequency ranges. Agilent's NVNA is the industry's first measurement and simulation environment for designing nonlinear components. The result is a high level of insight into nonlinear device behavior, making the NVNA capability especially useful for scientists researching new RF technologies and engineers involved in designing today's high-performance active devices. Using NVNA, X-parameters are measured and then used to create X-parameter models that can be imported into Agilent's Advanced Design System (ADS) to simulate actual linear and nonlinear component behavior. "The new PNA-X models, coupled with a wide range of measurement applications, provide engineers with flexibility that was previously not possible," said Gregg Peters, vice president and general manager of Agilent's Component Test Division. "Engineers can build their optimal test system by selecting the frequency range and measurements for their specific device test needs without paying for functionality they don't need." Single-connection, multiple measurements. This configurable 2- or 4-port network analyser offers a unique single-connection solution for CW and pulsed S-parameter, compression, intermodulation distortion (IMD), and noise figure measurements. Two built-in high-performance signal sources; the industry's only 2-port network analyser with an internal second source. Sources offer high output power (+16 dBm), low harmonics (-60 dBc) and a wide power sweep range (40 dB). A wide range of measurement applications for amplifiers, converters or modules with linear and nonlinear characterizations. Applications include vector noise figure, gain compression, IMD, true differential and NVNA. Internal signal-routing switches. Switches provide increased flexibility for adding signal conditioning hardware or additional test equipment for single connection measurements. Only network analyser with internal pulse modulators and generators for fast, simplified pulse measurements. This advanced capability enables pulse measurements up to 30 times faster compared with other analysers that require external generators and modulators.